Arnold Ramlogan far left the lead debater for prison inmates debate team, Team Intellect, in the prisons debate finals held at the Maximum Security Prison in Arouca. AN all-star prison debate team delivered a resounding defeat to the University of Trinidad and Tobago (UTT) students at Maximum Security Prison (MSP). With Prison Commissioner Gerard Wilson and high-ranking prison officials in attendance, the prison team, calling themselves Team Intellect, beat UTT by 990 points to 640. The team consisted of the top ten debaters from the interstation prison debates held between July and September 2018. Team Intellect represented four prisons: the Eastern Correctional Rehabilitation Centre (ECRC) Carrera, Golden Grove Remand and MSP. Using a modified Lincoln/Douglas debate format, both teams delivered passionate arguments at the January 29 debate on the topic, Are genetics responsible for criminal behaviour or are criminals a product of society? UTT chose the topic, so prisons chose the side to defend. UTT got stuck with the difficult argument of pinning genetic factors to crime. Using studies on crime and twins, UTT’s opening debater, Careem Spencer, presented a gruesome murder as his evidence of a genetic reason for crime, but he had difficulty making his case with convincing facts. He also connected anger and crime to a study on XYY chromosomes. Again, his arguments did not gel. MSP’s Arnold Ramlogan countered with a well-packed laundry list of factors contributing to crime that included social influences and parental inadequacies, and set Team Intellect on its winning path. The star of the debate emerged in the question-and-answer section, when Danyaal Muhammad (ECRC) delivered a searing set of tough questions that challenged UTT’s Celine Nemai and left no room to counter his team’s position. His last question forced Nemai to answer whether she considered Nelson Mandela a born criminal. UTT’s Ebony Hamilton cross-examined David Khan (Golden Grove Remand). Khan held steadfast, winning his round by a clear margin, countering all questions with poise and confidence. Aaron Charles (Carrera) countered UTT’s opening arguments about the XYY syndrome and its link to anger and crime, and then debunked the argument of a criminal phenotype. Once again, the prisons’ research duo of Ryan Ramoutar and his assistant Pream Bhadree proved a winning combination that fed the day’s arguments. They even anticipated UTT’s arguments, provided by research gathered from Orneiler Charles and Kareshma Ragoonathsingh. 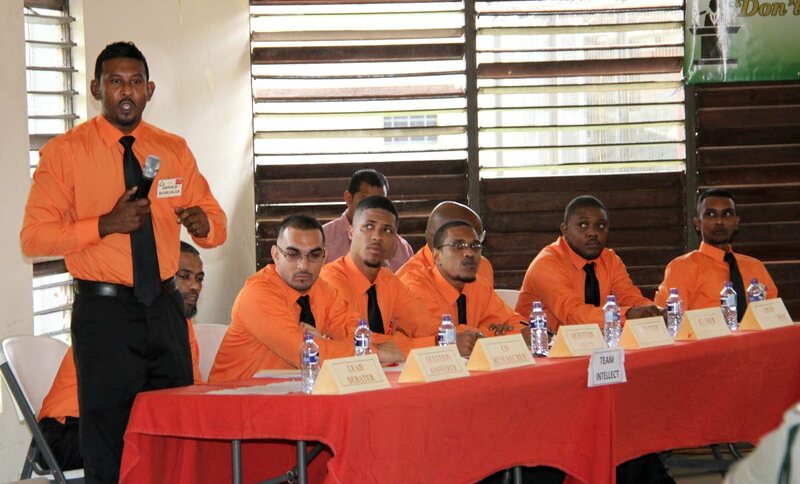 The prison debate team, led by MSP’s Officer Sherwin Johnson, will meet UTT in a rematch scheduled for April 4 at UTT. The topic will be: Is technology good for future generations? Reply to "Prison debate team triumphs over UTT"